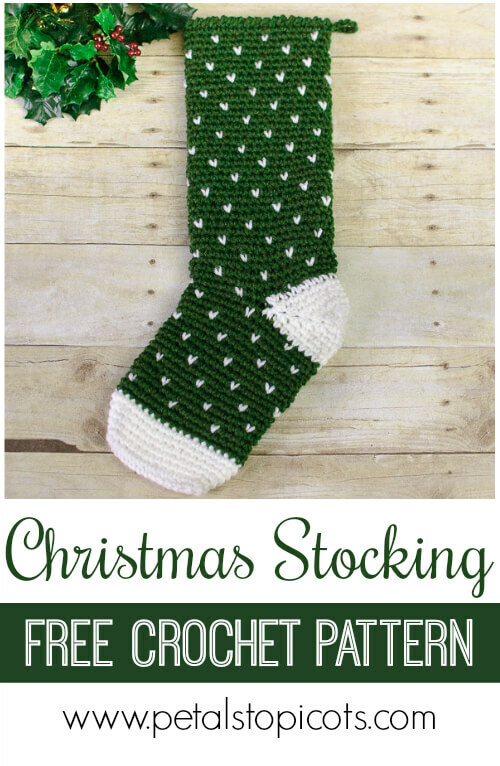 Crochet up this Evergreen Christmas Stocking crochet pattern to adorn your mantel! All you need is two balls of yarn and a weekend and you will have a holiday keepsake that is sure to be enjoyed for years to come. 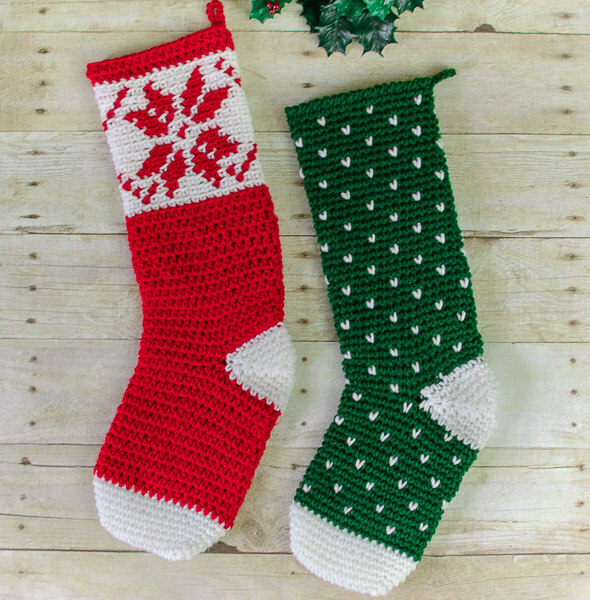 Pair it up with this coordinating Fair Isle Snowflake Stocking Crochet Pattern for a beautiful display. Gauge: 14 sc and 13 rows = approx. 4 in. Finished stocking measures approximately 18.5 in. long and 5.5 in. wide. To create the color change effect shown here, when working the CA single crochet, pull up a loop with CA, then yarn over and finish stitch with CB. 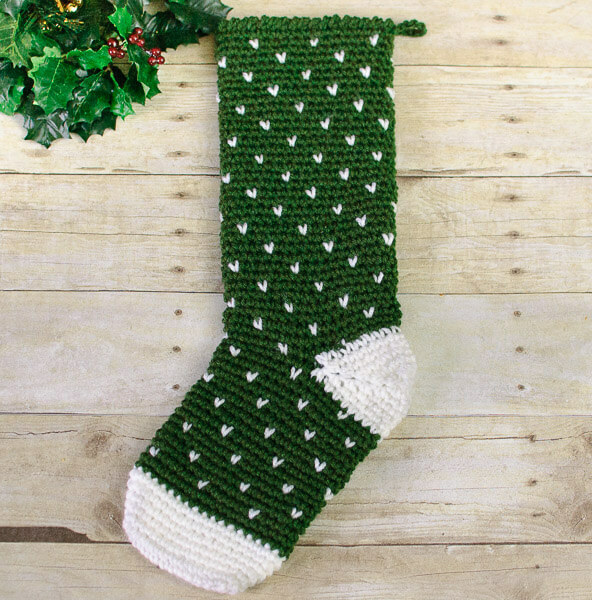 This Evergreen Christmas Stocking Crochet Pattern is not worked as conventional sock but instead is designed to lay nicely when hung. Round 8: Join CB, ch 1, work 1 sc in each st around, join – 36 sts. Round 9: Continuing with CB ch 1, work 1 sc in each st around, join – 36 sts. Round 10: Following color changes in row A of charted pattern below (also see note above on color changes), ch 1, *work 1 CA sc, 1 CB sc in each of the next 5 sts, repeat from * around, join – 36 sts. Round 11: With CB ch 1, work 1 sc in each st around, join – 36 sts. Round 12: Following color changes in row B of charted pattern below, ch 1, *work 1 CB sc in each of the next 3 sts, 1 CA sc in next st, *1 CB sc in each of the next 5 sts, 1 CA sc in next st, repeat from * around until 2 sts remain, work 1 CB sc in each of the last 2 sts, join – 36 sts. Rounds 13 through 24: Repeat Rounds 9 through 12. Round 25: On same side as fasten off, Rejoin CB in center stitch right before a CA st. Ch 1, work 1 sc in same st, ch 18, skip next 18 sts (for the heel), work 1 sc in each of the remaining 17 sts, join – 36 sts. Leaving skipped heel sts for now, continue working pattern in sts and chains from Round 25. Round 26: Following color changes in row B of charted pattern above, ch 1, *work 1 CB sc in each of the next 3 sts, 1 CA sc in next st, *1 CB sc in each of the next 5 sts, 1 CA sc in next st, repeat from * around until 2 sts remain, work 1 CB sc in each of the last 2 sts, join – 36 sts. Round 27: With CB ch 1, work 1 sc in each st around, join – 36 sts. Round 28: Following color changes in row A of charted pattern above, ch 1, *work 1 CA sc, 1 CB sc in each of the next 5 sts, repeat from * around, join – 36 sts. Round 29: With CB ch 1, work 1 sc in each st around, join – 36 sts. Rounds 30 through 61: Repeat Rounds 26 through 29. Round 62: Working back across sts just made, work 1 rev. sc in each st. Round 1: Join CA to first skipped st from Round 25, ch 1, sc2tog, 1 sc in each of the next 14 sts, sc2tog; rotate to work in bottom loops of ch from Round 25, sc2tog, 1 sc in each of the next 14 sts, sc2tog, join in first st – 32 sts. 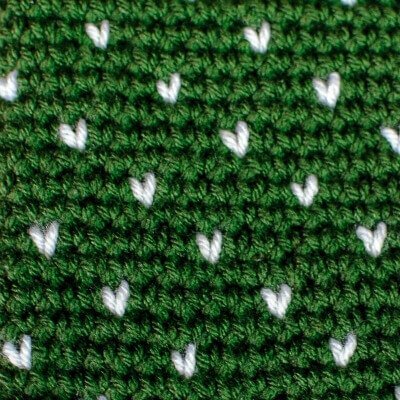 Click here for the Fair Isle Snowflake Stocking Pattern shown above.